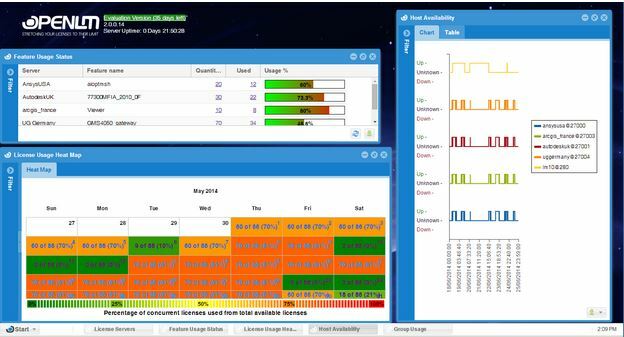 The OpenLM Floating license monitoring and Usage optimization tool interfaces an ever growing variety of license managers, such as Flexera FlexLM (Flexnet publisher), Beta LM, IBM LUM, DSLS, Sentinel HASP, Sentinel RMS, Reprise RLM, MathLM, LM-X and Easycopy. 2. 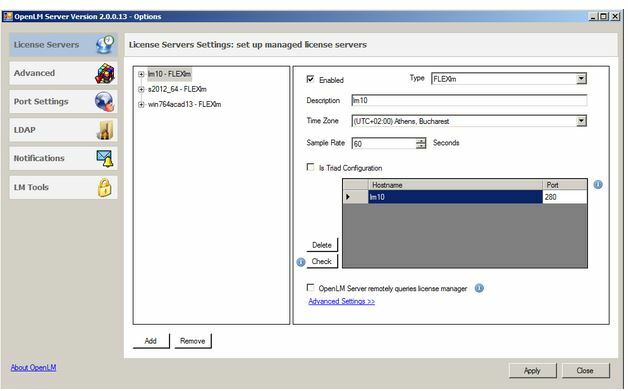 Select a license server and click the check button in order to ensure that OpenLM can retrieve information from that license server. This information is the input received from the License manager. 3. Repeat steps 1 & 2 for all license servers (as needed). The OpenLM EasyAdmin opens. Click the EasyAdmin start button to explore this application’s features. The image above is an example of an EasyAdmin workspace. It features Administrative tools, License data, License usage data, Graphic usage representation, Roles and permissions’ assignment, and Active Agent capabilities. For more information on the OpenLM EasyAdmin web interface, please refer to this document. YOU NOW HAVE AN UP AND RUNNING OPENLM SYSTEM. For further information regarding the installation and preliminary configuration of the OpenLM system components, please refer to the “Application Note 2010: OpenLM license management system Complete Installation guide v1.8” document.